On 15 March 2019, Climate Analytics and the Centre de Partenariat et d’Expertise pour le Développement Durable organized the vulnerability studies launch workshop in Cotonou, Benin. During the workshop, which brought together over 50 stakeholders, including researchers, policy makers, private sector representatives, civil society, and international donors, vulnerability assessments in three priority sectors – agriculture, water resources and health – were officially launched by the Minister of Living Environment and Sustainable Development (Ministre du Cadre de Vie et du Développement Durable – MCVDD). The three studies form part of the scientific capacity building component of the Science-based National Adaptation Planning in Sub-Saharan Africa project, a project funded by the German Federal Ministry for the Environment, Nature Conservation and Nuclear Safety (BMUB), and implemented by the Deutsche Gesellschaft für Internationale Zusammenarbeit (GIZ) in collaboration with Climate Analytics. Since 2010 Conference of Parties (CoP) in Cancún, the Parties have agreed on the process of National Adaptation Plans (NAPs) as a mechanism to identify adaptation needs and define strategies and programs to reduce vulnerability to climate change and integrate adaptation as an integral part of development planning and processes for Least Developed Countries (LDC). To be eligible for international funding, developing countries’ adaptation plans and projects increasingly need to show that they address problems attributed to climate change rather than generic development problems, making it extremely important to assess the vulnerability of countries’ development sectors to climate change and identify concrete science-based adaptation measures. The component 2 of the PAS-PNA project, implemented by Climate Analytics, addresses this challenge by building scientific capacity of various national actors for the planning of adaptation measures. More specifically, it accompanies three groups of researchers from national universities, public research institutes, and practitioners from government agencies in conducting in-depth vulnerability studies and in identifying climate change adaptation priorities and measures. “[the initiative is in line with] the political and institutional commitment of the Government of Benin for better science-informed decisions, particularly with regards to climate change mitigation and adaptation planning”. “The studies will enhance the understanding of the challenges posed by climatic hazards to the country’s Development Plan and path. […] their outcomes will support the development of a portfolio of vital national projects drawn from national climate change strategies, plans and policies” said Mr. Assan Seibou, Director of CePED. The strong commitment to climate action and NAPs and the valuable synergies of actions among the wide range of stakeholders involved in Benin’s climate change adaptation and mitigation initiatives were key takeaways from the event. First, the process of planning and co-designing the vulnerability assessment methodology has seen a strong and continuous engagement and commitment of researchers from national universities, public research institutes, and practitioners from government agencies. Accompanied by Climate Analytics and supervised by a team of eminent scientists in the sphere of climate change in Benin, these national experts are in charge of the vulnerability assessments in the three pre-identified sectors. The whole process will be monitored by a national committee composed of policy actors from the Ministry of Agriculture, Livestock and Fisheries (MAEP), the Ministry of Health (MS), the Ministry of Energy, Water and Mines (MEEM) and the Minister of Living Environment and Sustainable Development (MCVDD), stakeholders from the private sector and civil society, and key actors from the local governance system. This multi-stakeholder approach of knowledge co-production facilitated by Climate Analytics is unique and crucial in facilitating a better integration and uptake of vulnerability assessment results in the NAP process as well as in sectorial climate change-related policies and strategies. 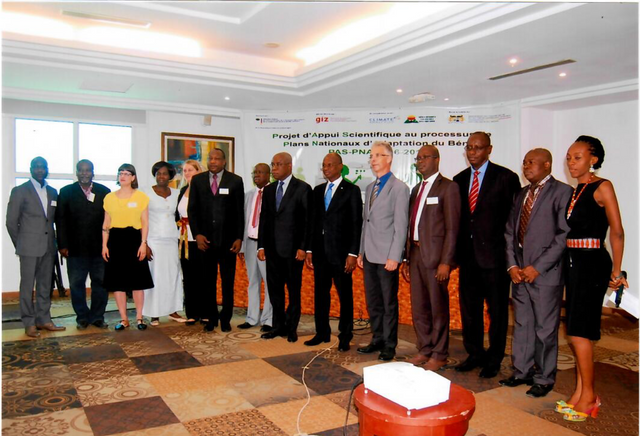 Second, there is a synergy of actions between international donors and partners in supporting the Government of Benin in addressing climate change issues, beyond the three sectors – agriculture, water resources and health – which are the focus of the vulnerability assessment studies in PAS-PNA project. This synergy has been acknowledged by the UN Resident Coordinator and UNDP Resident Representative Mr. Siaka Coulibaly, who highlighted the complementarity between PAS-PNA project and the Benin National Adaptation Plan Global Support Program (NAP-GSP). The NAP-GSP targets other sectors, such as energy, transport and infrastructure, forestry and coastal zones. Ever more intense climatic events are rapidly pushing Small Island Developing States to the verge of their coping capacities, beyond which they will experience irreparable loss and damage. These risks threaten the socio-economic stability and undermine already limited abilities to achieve the Sustainable Development Goals. A recent event hosted by the Government of Belize looked at ways of increasing understanding and international cooperation to address this urgent issue.